The system of Japanese numerals is the system of number names used in the Japanese language. The Japanese numerals in writing are entirely based on the Chinese numerals and the grouping of large numbers follow the Chinese tradition of grouping by 10,000. Two sets of pronunciations for the numerals exist in Japanese: one is based on Sino-Japanese (on'yomi) readings of the Chinese characters and the other is based on the Japanese yamato kotoba (native words, kun'yomi readings). There are two ways of writing the numbers in Japanese: in Arabic numerals (1, 2, 3) or in Chinese numerals (一, 二, 三). The Arabic numerals are more often used in horizontal writing, and the Chinese numerals are more common in vertical writing. Most numbers have two readings, one derived from Chinese used for cardinal numbers (On reading) and a native Japanese reading (Kun reading) used somewhat less formally for numbers up to 10. In some cases (listed below) the Japanese reading is generally preferred for all uses. * The special reading 〇 maru (which means "round" or "circle") is also found. It may be optionally used when reading individual digits of a number one after another, instead of as a full number. A popular example is the famous 109 store in Shibuya, Tokyo which is read as ichi-maru-kyū (Kanji: 一〇九). (It can also be read as 'ten-nine' - pronounced tō-kyū - which is a pun on the name of the Tokyu department store which owns the building.) This usage of maru for numerical 0 is similar to reading numeral 0 in English as oh. It literally means a circle. However, as a number, it is only written as 0 or rei (零). Additionally, two and five are pronounced with a long vowel in phone numbers (i.e. にい and ごお nii and goo). Starting at 万, numbers begin with 一 (ichi) if no digit would otherwise precede. That is, 100 is just 百 hyaku, and 1000 is just 千 sen, but 10,000 is 一万 ichiman, not just *man. This differs from Chinese as numbers begin with 一 (ichi) if no digit would otherwise precede starting at 百. And, if 千 sen directly precedes the name of powers of myriad, 一 ichi is normally attached before 千 sen, which yields 一千 issen. That is, 10,000,000 is normally read as 一千万 issenman. But if 千 sen does not directly precede the name of powers of myriad or if numbers are lower than 2,000, attaching 一 ichi is optional. That is, 15,000,000 is read as 千五百万 sengohyakuman or 一千五百万 issengohyakuman, and 1,500 as 千五百 sengohyaku or 一千五百 issengohyaku. The numbers 4 and 9 are considered unlucky in Japanese: 4, pronounced shi, is a homophone for death (死); 9, when pronounced ku, is a homophone for suffering (苦). See tetraphobia. The number 13 is sometimes considered unlucky, though this is a carryover from Western tradition. On the contrary, numbers 7 and sometimes 8 are considered lucky in Japanese. Tens from 20 to 90 are "(digit)-jū" as in 二十 (ni-jū) to 九十 (kyū-jū). Hundreds from 200 to 900 are "(digit)-hyaku". Thousands from 2000 to 9000 are "(digit)-sen". There are some phonetic modifications to larger numbers involving voicing or gemination of certain consonants, as typically occurs in Japanese (i.e. rendaku): e.g. roku "six" and hyaku "hundred" yield roppyaku "six hundred". * This also applies to multiples of 10. Change ending -jū to -jutchō or -jukkei. ** This also applies to multiples of 100. Change ending -ku to -kkei. In large numbers, elements are combined from largest to smallest, and zeros are implied. Beyond the basic cardinals and ordinals, Japanese has other types of numerals. Distributive numbers are formed regularly from a cardinal number, a counter word, and the suffix -zutsu (ずつ), as in hitori-zutsu (一人ずつ, one person at a time, one person each). Variation is due to Jinkōki, Japan's oldest mathematics text. The initial edition was published in 1627. It had many errors. Most of these were fixed in the 1631 edition. In 1634 there was yet another edition which again changed a few values. The above variation is due to inconsistencies in the latter two editions. However, numbers written in Arabic numerals are separated by commas every three digits following English-speaking convention. If Arabic numbers and kanji are used in combination, Western orders of magnitude may be used for numbers smaller than 10,000 (e.g. 2,500万 for 25,000,000). In Japanese, when long numbers are written out in kanji, zeros are omitted for all powers of ten. Hence 4002 is 四千二 (in contrast, Chinese requires the use of 零 wherever a zero appears, e.g. 四千零二 for 4002). However, when reading out a statement of accounts, for example, the skipped digit or digits are sometimes indicated by tobi (飛び) or tonde (飛んで): e.g. yon-sen tobi ni or yon-sen tonde ni instead of the normal yon-sen ni. Japanese has two systems of numerals for decimal fractions. They are no longer in general use, but are still used in some instances such as batting and fielding averages of baseball players, winning percentages for sports teams, and in some idiomatic phrases (such as 五分五分の勝負 "fifty-fifty chance"), and when representing a rate or discount. The bu fractions are also used when talking about fevers - for example 九度二分 (kudonibu) for 9 and two parts - the temperature 9.2°C. This is the system used with the traditional Japanese units of measurement. Several of the names are used "as is" to represent a fraction of a sun. As with Chinese numerals, there exists in Japanese a separate set of kanji for numerals called daiji (大字) used in legal and financial documents to prevent unscrupulous individuals from adding a stroke or two, turning a one into a two or a three. The formal numbers are identical to the Chinese formal numbers except for minor stroke variations. Today, the numbers for one, two, three, and ten are written only in their formal form in legal documents (the numbers 4 to 9 as well as 100, 1000 and 10000 are written identically to the common ones, cf. table below). These numbers' common forms can be changed to a higher value by adding strokes (1 and 2 were explained above, while 3 can be changed to 5, and 10 to 1000). In some cases, the digit 1 is explicitly written like 壱百壱拾 for 110, as opposed to 百十 in common writing. The four current banknotes of the Japanese yen, 1000-yen, 2000-yen, 5000-yen, and 10000-yen, have formal numbers 千, 弐千, 五千, and 壱万, respectively. Old Japanese shares some vocabulary with later periods, but there are also some unique numbers which are not used any more, aside from being parts of specific lexemes. The transcription is based on the phoneme and is not phonetic. See Old Japanese for further information. See Jōdai Tokushu Kanazukai for information on subscript notation. 7 nana 七瀬 nanase (many rapids) Often used to mean many. 8 ya 八雲 yakumo1 (many clouds) Often used to mean many. 10 so1 三十 mi1so1 (30), 四十 yo2so1 (40), 六十 muso1 (60), 八十 yaso1 (80) Found only in compound words; not used alone. 100 po 五百 ipo (500), 五百年 ipoto2se (500 years), 五百夜 ipoyo2 (500 nights), 八百 yapo (800), 三百 mi1po (300), 六百 mupo (600), 九百 ko2ko2no2po (900) Used for multiple hundreds in compound numerals. Often used to mean many. 100 mo1mo1 百日 mo1mo1ka (many days) Used for non-multiple hundred and for the number "100" by itself. Often used to mean many. 1000 ti 千年 tito2se (1000 years, many years) Often used to mean many. 10000 yo2ro2du 八百万 yapoyo2ro2du (8000000, myriad) Often used to mean many. Japanese uses separate systems for counting for oneself and for displaying numbers to others, which both proceed up to ten. For counting, one begins with the palm open, then counts up to five by curling up (folding down) the fingers, starting from the thumb – thus one has just the thumb down (and others extended), while four has only the pinkie extended, and five has a fist. One then counts up to ten by proceeding in the reverse order, extending the fingers, starting at the pinkie – thus six is the same as four, seven the same as three, and so forth, with ten ending with the palm open. While this introduces ambiguity, it is not used to present to others, so this is generally not a problem. When displaying for others, one starts with the hand closed, and extends fingers, starting with the index, going to the pinkie, then ending with the thumb, as in the United States. For numbers above five, one uses an open hand (indicating five) and places the appropriate number of fingers from the other hand against the palm (palms facing each other) – so six has the index finger against the palm, and so forth. To display ten, one presents both hands open and palm outwards. Since the adoption of Arabic numerals, numbers have become written in Arabic numerals more and more often. Counters and ordinal numbers are typically written in Arabic numbers, such as 3人 (three people), 7月 (July, "seventh-month"), 20歳 (age 20), etc., although 三人、七月、and 二十歳 are also acceptable to write (albeit less common). However, numbers that are part of lexemes are typically written in kanji. For example, the term yaoya 八百屋 (tr. : vegetable stand / grocer) translates into "800 store", uses the Old Japanese pronunciation for 800, ya(h)o. 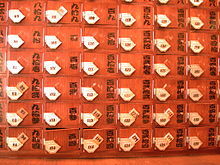 The notorious Japanese national gang, the yakuza, can be written 八九三 (or 893), a hand in oicho-kabu that is worth 0 points, indicating that yakuza are "worthless persons" or "gambling persons". ^ "The number of death: Lucky and unlucky numbers in Japan". The Science of Language Self-Study | LinguaLift Blog. Retrieved 2016-03-24. ^ "What is the origin of yakuza?". www.sljfaq.org. Retrieved 2016-03-24.